Funny Bunnies (3) are marked Mattel Inc. Hong Kong or Taiwan on their backs, display cards are marked 1967.
an ornament on a Christmas tree; Santa for Christmas, Luvy Duvvy for Valentine's day. or blue fuzzy bunny suit. 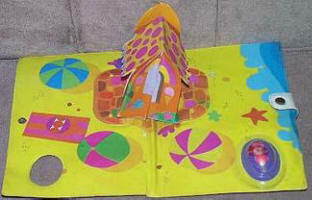 3" tall, marked Mattel Inc. Hong Hong or Taiwan, card is marked 1968, has a loop to hang on a tree. 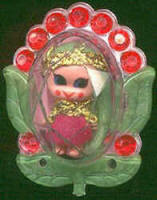 2 1/2" tall, marked Mattel Inc. Hong Kong or Taiwan, card is marked 1968, has safety pin on back. 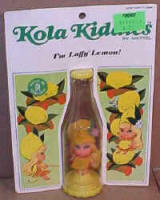 The Mattel Kola Liddle Kiddle dolls are 2" tall and the bottles are 5" tall. There are six dolls in this series. Lemon blonde hair, painted eyes and mouth, dressed in lemon yellow outfit and hat, painted shoes, bottle has yellow base and cap. Red rooted short hair with bangs, blue painted eyes, closed smiling mouth, dressed in a red and lime green outfit and hat with strawberry attached. Bottle has a red base and cap. Lavender rooted long hair with bangs, purple outfit, hat with attached grapes, painted shoes, purple base and cap. Olivia Orange on left is the normally found doll with curly short orange hair, orange outfit and hat, painted shoes. Olivia Orange on right is rare as she has a Bubble-cut hair-do. Rusty brown rooted hair in a up-do with bangs, brown painted eyes, closed mouth, brown outfit and gold hair braid tie, brown painted shoes. Brown cola colored base and cap. Lime green rooted long straight hair, blue painted eyes, closed smiling mouth, wears a lime green outfit with lime green and mustard hat with a lime attached, and painted pink shoes. Lime green base and cap. 1968 to 1970. 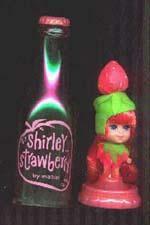 Liddle Liddle dolls and bottles are marked Mattel Inc. Hong Kong or Taiwan. Red hair, clear & pink bottle, hot pink cap & base. Lavender hair, clear & purple bottle, green cap & base. 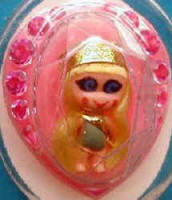 Yellow hair, clear & pink bottle, yellow cap & base. White hair, clear & blue bottle, reddish-pink cap & base. 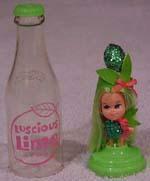 Green or yellow hair, clear & green bottle, cap & base. Blue hair, clear & blue bottle, hot pink cap & base. 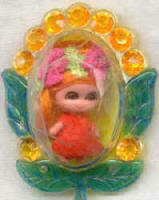 White hair, clear & green bottle, orange cap & base. 3708 Sweet Three Boutique 1967: A) Violet, Sweet Pea & Lily of the Valley Kologne's. B) Rosebud, Honeysuckle, Apple Blossom Kologne's. 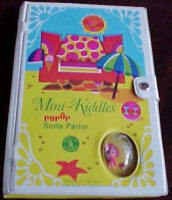 The Mini Pop-Up dolls are the same as the jewelry Kiddles only packaged differently and are all only 7/8" tall. 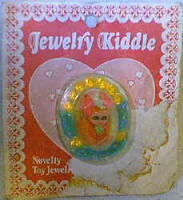 whereas the below shown Jewelry Kiddles were marketed 1968-1970. She has green hair and blue eyes, wears a deep pink flocked dress with gold braid trim. Doll is the same as the 3744 Jewelry, Flower Ring. 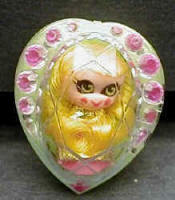 Gretal has blond hair in two long pipe curls, blue eyes, wears an orange vinyl dress trimmed with gold ribbon or glitter, same doll as the 3744 Jewelry, Heart Ring. 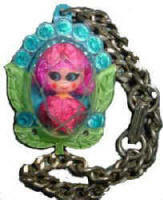 Kutie has hot pink or light pink hair, blue eyes, wears a pink ruffled dress of satin, she is the same doll as the 3747 Jewelry Flower bracelet. 3778 Soda Parlor, shown with book opened, the doll is shown in her clear bubble on the lower right. MOC 3741 Flower Pin 1968-1970 on original card. See close-up of doll on right. In orange, yellow, green and pink hat. 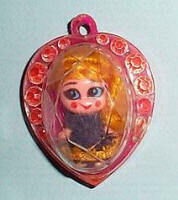 This one is also found with light pink hair color, shown is with hot pink hair.